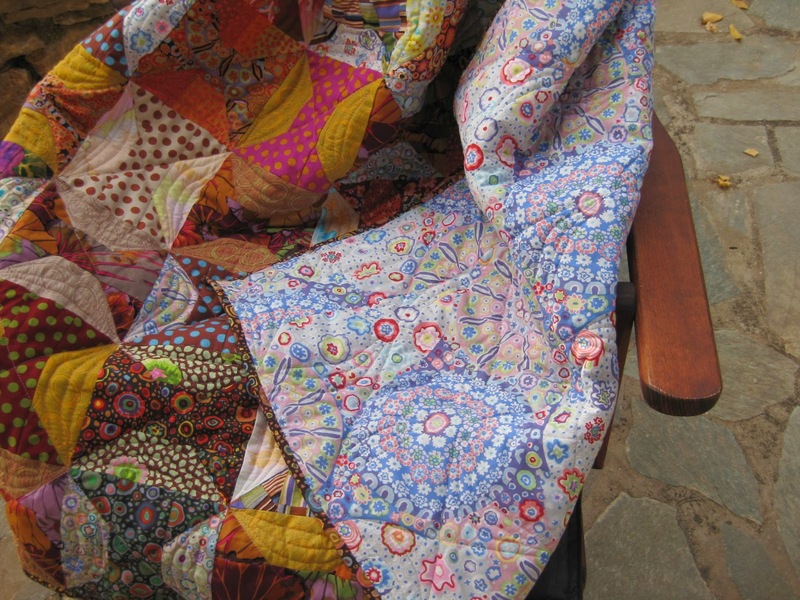 This quilt is the second one I did using Kaffe Fassett fabrics. The first one was the Fan pattern which I offered to my niece in Paris. For this second one, I chose the Spools pattern and thought of using more neutral tunes from Kaffe Fassett range in order to give it a warm kind of autumn harmony. I also hoped I would have enough fabrics and leftovers in my stash, and I would not need to buy more, but unfortunately when I displayed the blocks on the design wall, I realized that I did not obtain the wished result and that I would need to get some more fabrics to "break" the too warm harmony. Therefore I ordered some more neutral fabrics and enough yardage of the blue one to use it for the backing. I am quite pleased with the final result, I think this blue fabric cools the whole thing. What a beautiful quilt, Christine! 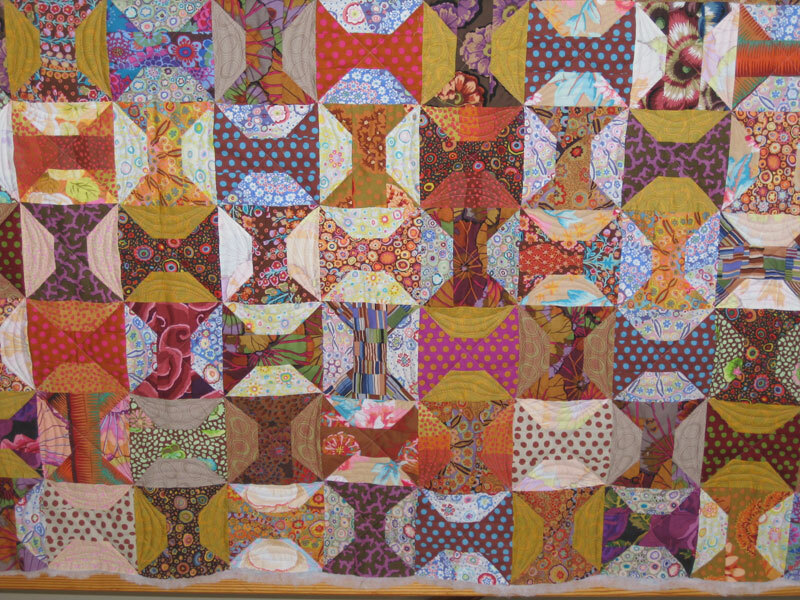 It has a lovely autumnal feel and the Fassett fabrics are just gorgeous. WOW! You hit this one out of the ball park! It is magnificent and the colours are lovely! Very Autumn...but in a warm subtle way! LOVE IT!!! I love this quilt!! It is fabulous! Your fabric selection and placement are perfect! Congratulations on a wonderful finish! 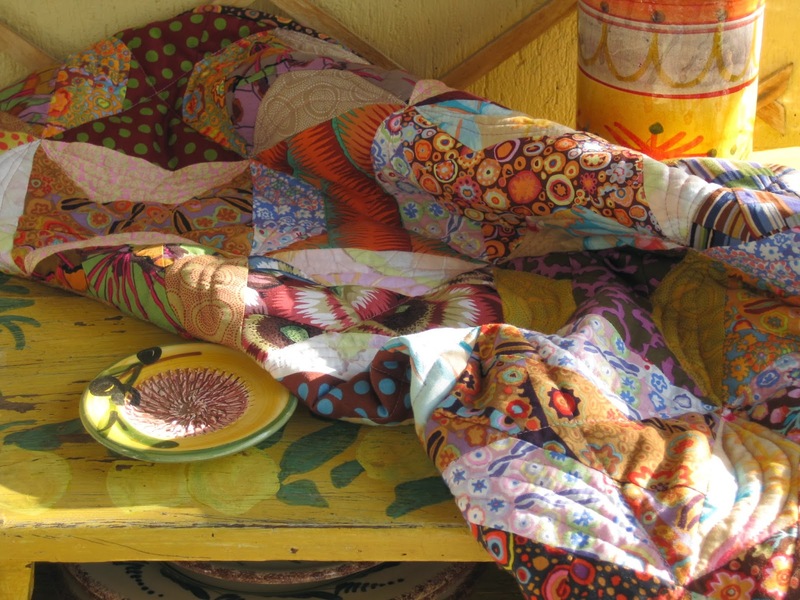 It is gorgeous - love the warm colours and Kaffe's fabrics are so timeless! I like the way you have quilted it too. Love it! I am making one out of vintage feedsacks. Again, I love your latest work!!!! wonderful! Beautiful! I like the addition of the blue. It adds so much to the quilt. Nice work! 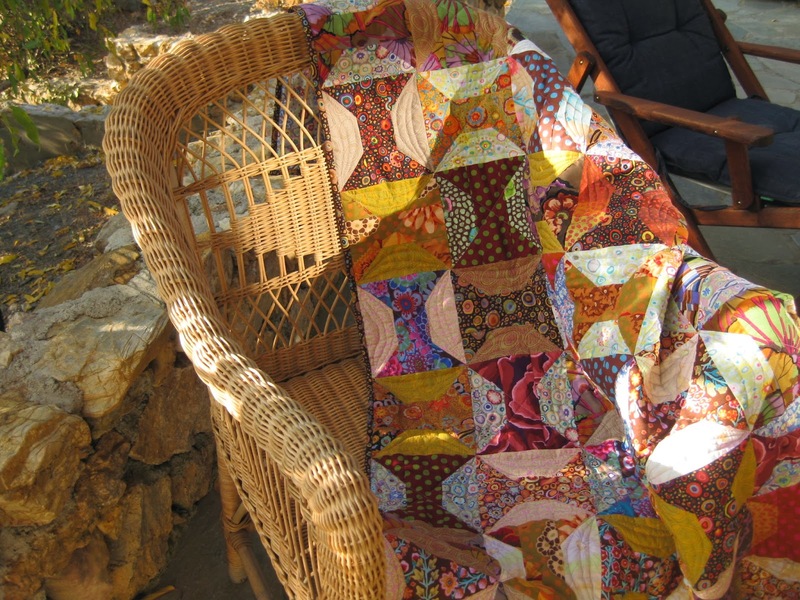 Your scrappy spools quilt turned out great. I can just imagine someone snuggling under it this fall. Excitingly beautiful. I have never chosen the spool as a favorite design but the fabrics you chose makes it striking. Great job!!! OMG I absolutely love this quilt. its beautiful. the blue does add interest, great choice. Delighted I checked your blog. this is my kind of quilt!! 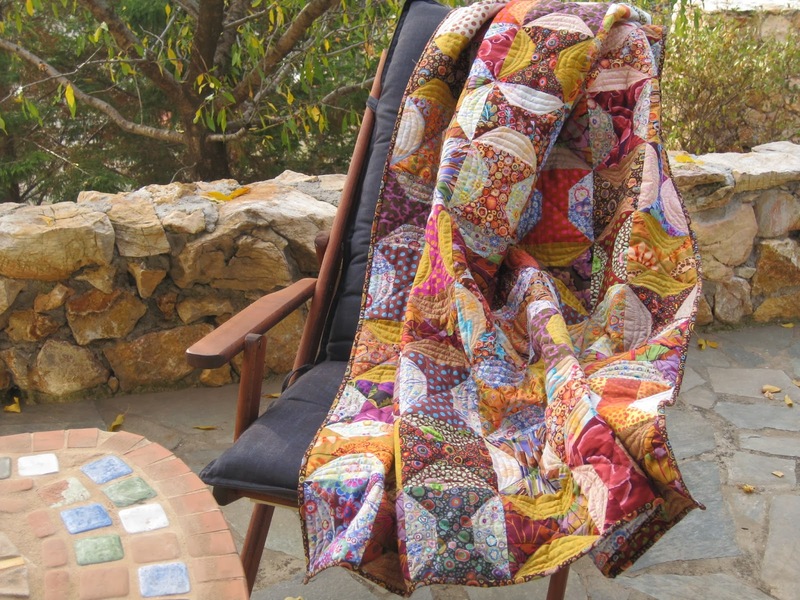 A gorgeous quilt! Love that backing too! The photographs make it look even more yummy to cuddle up in! What a luscious quilt! I would love some of that backing fabric too. Very nice! 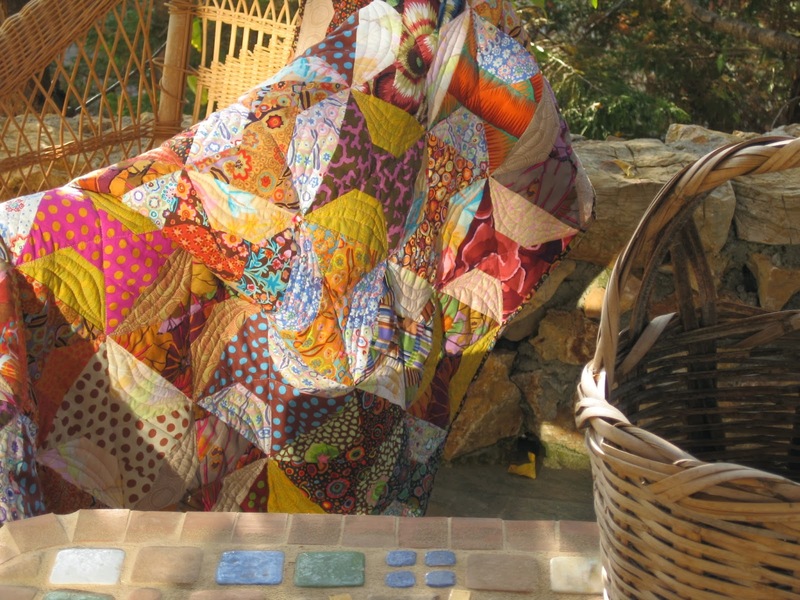 I love Kaffe Fassett fabrics; one Christmas before I became an avid quilter my mom bought me a nice big bundle and that was the beginning of my love affair with quilting! I have also wanted to do a spools quilt for my mom, a sewer herself. I was going to do it with my dad's old ties, as a memoriam, and make it a wall hanging. You have bumped that up to the top of my list. Great job. I usually am not a fan of Autumn colors but your contrast makes this a favorite. Beautiful.